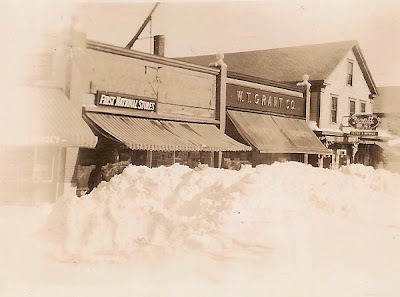 Despite the towering piles of snow which line the sidewalks, it was business as usual for the stores along Center Street in the aftermath of this late 1930s snowstorm. Pictured is at the center of the photograph is the Ryder Block which had three tenants at the time including the First National grocery store and the W. T. Grant Co. In 1940, the First National had a new building constructed for itself on the corner of Center and School Streets (the building now occupied by Benny's) and relocated there. Grant's absorbed the former First National space and occupied the two stores until moving to North Main Street in 1957. The main space in this building was later long occupied by the Boston Store operated by Alton and Eunice Kramer. It has since been occupied by antique stores. The smaller space historically has been tenanted by various businesses including the Work Basket, a sewing store, and by florists. It is now the home of Honey Dew Donuts. The building at the far right, presently occupied by Hollyberries gift shop, has the likely distinction of being the oldest building remaining on Center Street having been built about 1833. Originally occupied as a dwelling house by William S. Pierce of New Bedford and later Dr. Chapin, in 1875 the pharmacy of Shaw & Childs leased the house for use by their business. Shaw & Childs, a partnership of Jacob Shaw and Abbott Childs, built an addition to the front of the house, sacrificing what had once been a spacious front lawn surrounded by a white fence. Following Shaw's death, Abbott continued to operate the firm until 1906 when it was acquired by Jesse F. Morse, a pharmacist formerly with the Smith & Hathaway drug store at the Four Corners. Morse operated the store as a Rexall pharmacy until his death in 1948 after which he was succeeded by Leo P. LaForest (who operated the store from 1948 to 1963) and Ronald Craig. During this period, from 1920 through 1965, jewelers M. L. Hinckley & Son also occupied space in the ell of the building. In 1985, the Colonial Office Supply established operations in the building which it disguised under a facade designed to resemble a barn. Antique dealer Sam Pierce later renovated the building to resemble its earlier appearance. For several years now, the building has been occupied by Hollyberries Country Gifts and Collectibles. Hey great website! Finally something on Middleboro that has some really great info. I have a ton of old post cards of Middleboro if you ever want me to send them to you let me know. I actually started a photo album of just Middleboro on my facebook page. Hi Laura, thanks for the positive feedback. I received your message today regarding both your grandfather Dr. McLean, and the Middleborough Poor Farm. I'd love to learn more, but don't have a way to contact you! Any stories or photos you'd like to share, I'd be happy to post. Just let me know. You can contact me directly by clicking on the envelope in the right hand margin. Thanks!